In the three months since the 1940 U.S. Census was released, volunteers have been busy scouring batch after batch for the information that will ultimately create a free index to World War II America. And amazing strides have been made. But there’s still a ways to go, and in the patriotic spirit of the week in which we celebrate America’s independence, FamilySearch has issued a challenge for us all to rise to. They’ve set a goal of indexing “5 Million Names” on July 2nd, and you can help! If you’ve already done some indexing, you know how fun and rewarding it can be. It actually becomes addictive after awhile. Now I admit I’ve slacked off after my initial efforts—I didn’t index a single batch in June, sorry to say. So this challenge is the perfect time for me to get going again. I want to be able to see FamilySearch meet its goal and know I helped a little bit. Besides that, it’s just fun to be part of a historic event in the making. And if you haven’t tried indexing yet, well, there’s no time like the present. It’s easy, and doesn’t take much time once you get the hang of it. Just go to the1940census.com and click on the button that says “Get Started.” They’ll give you full step-by-step instructions (there’s only three) and a few sample records to try. Then you can pick the state you’d like to index and download your first batch. You don’t have to have any special skills, and there’s nothing intimidating about it. When I first started indexing, I made some rookie mistakes over and over. For example, I thought “Same Place” and “Same House” were interchangeable terms (they aren’t). A few clarifications helped me a lot. The best summary I’ve seen of tips and clarifications for better results is FamilySearch Indexing the 1940 Census—How to Get it Right! by Kimberly Powell on About.com Genealogy. The few minutes it takes to read her article can save you time, raise your accuracy, and help you solve any problems you might encounter. If you’d like to see the progress made on the 1940 Census Community Project so far, Leland Meitzler has the latest count here. He also has an update on how Ancestry.com is coming along with its indexing efforts (they have Ohio done now!). Note that the definition of “July 2” is based on Greenwich Mean Time (London time). So in the U.S., for your batches to count for that day, you can actually start contributing them on Sunday, July 1st at 5 p.m. Pacific Time, 6 p.m. Mountain Time, 7 p.m. Central Time, and 8 p.m. Eastern Time. Then figure 24 hours from your time, and you have the boundaries for the challenge. So what are you waiting for? Let’s get indexing, have some fun, and set a new record! I wonder if there’s a category for “Most Names Indexed in a Day” in the Guinness Book of World Records? UPDATE, JULY 4, 2012: We did it! A big thanks to everyone who indexed batches of the 1940 U.S. census on July 2nd as part of the Five Million Names challenge. 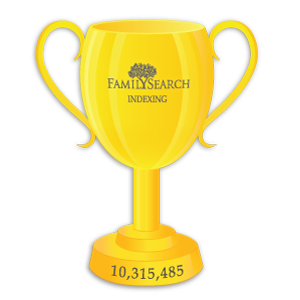 FamilySearch has reported that we blew past that goal, indexing over 7 million records in 24 hours. And if you add in the efforts of arbitrators, who processed over 3 million records, the final tally was (drum roll, please) 10,340,879 records added! How awesome is that?